You can walk or cycle along this route and take the youngest ones of the family with you. You can walk or cycle along this route and take the youngest ones of the family with you. Choose Palafrugell’s Tourism Office at av. Generalitat as the starting point for the greenway. Take av. Espanya down to the next roundabout, look for Carrilet Street and then turn left to find the “Little train” route. From here on the path is sign-posted behind the Mont-ras and Torre Simona neighborhood. When you get to the crossing roads, just after the greenhouses on your right, we suggest you to turn left*. 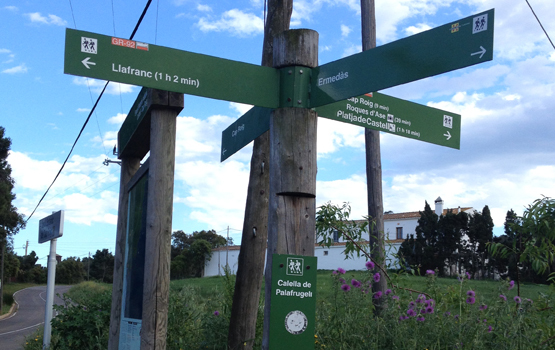 If instead you keep going straight, you will reach Palamós township. After the petrol station at the end of the path, follow the cycling way until you reach the sea promenade, just in front of Palamós beach. You can make the most of it visiting the fishing museum. *If you turn left at the crossing, follow the path, pass the naturist camping site on your left, sweat with the climb and you will only have 1 km left to get to your destination: Castell beach, a nice spot to have a swim where you can also visit the Iberian settlement of Castell (ref. 9). To return, the easiest way is to take the same path which you came along. But if you still have some energy left and you would like to see a different landscape, we recommend you to go to Cap Roig. If you are cycling, take the GR92 direction north; you’ll find the path just before arriving to the beach, chained off during the summer months to block access to cars. If you are walking, you can also take the coastal path from Castell beach and walk north to find wild and lonely coves among which Estreta and el Crit are the most noteworthy. You will not be indifferent!